Rethinking the SAT is a unique presentation of the latest thoughts and research findings of key individuals in the world of college admissions, including the president of the largest public university system in the U.S., as well as the presidents of the two companies that sponsor college admissions tests in the U.S. The contributors address not only the pros and cons of the SAT itself, but the broader question of who should go to college in the twenty-first century. 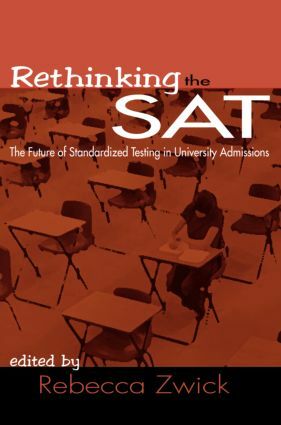 PART I Standardized Tests and American Education: What Is the Past and Future of College Admissions Testing in the United States? PART II College Admissions Testing in California: How Did the California SAT Debate Arise? PART III Race, Class, and Admissions Testing: How Are Test Scores Related to Student Background and Academic Preparation? PART IV The Predictive Value of Admissions Tests: How Well Do Tests Predict Academic Success for Students from a Variety of Backgrounds? Replacing Reasoning Tests with Achievement Tests in University Admissions: Does It Make a Difference?